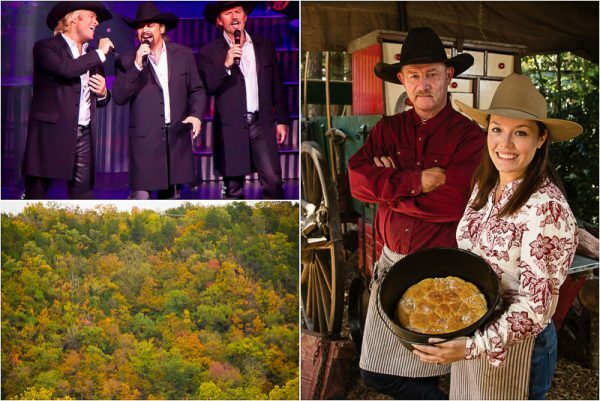 The Texas Tenors, Kent Rollins Chuck Wagon Cooking, and the Ozarks’ Fall Foliage are just some of the Branson Highlights for October..
BTC’s Best Branson Insider Highlights, for October 2018, highlights limited engagement performances and major events taking place during the month that are in addition to all the other live shows, attractions, and everything else Branson offers on a daily basis. They are listed by category, sorted in order of starting date, and are preceded by our Feature Show, Limited Engagement, and Event of the month. Featured Limited Engagement of the Month: Since their national debut on NBC’s hit prime time show America’s Got Talent in 2009, The Texas Tenors have become one of the most popular singing groups in America. In addition, to a full concert schedule and many hit recordings, they have filmed two PBS Specials, “You Should Dream” and, just recently their newest, “Rise.” The show is in concert format containing many covers and original music including country, classical, gospel, Broadway, and more. From their first number to the last, the power, beauty, and intensity of each totals up to an unforgettable entertainment experience that should not be missed! Featured Event of the Month: Silver Dollar City’s National Harvest & Cowboy Festival showcases the largest gathering of demonstrating craftsmen in the country as more than 125 visiting craftsmen and over 100 of Silver Dollar City’s resident craftsmen showcase their diverse array of talents and skills. The festival also features a “Salute to the Great American Cowboy” including Buck Taylor’s Cowboy Emporium; an old-fashioned barn dance; Kent Rollins chuck wagon cooking; the final year for the Buffalo Bill inspired Wild West Show; and much more. It was named “One Of The Nation’s Top 8 Fall Harvest Festivals” by U.S. News & World Report Travel, as well as “The Best Fall Festival in Missouri” by Travel & Leisure! And it’s all in addition to everything else this world class theme park offers on a daily basis. * On select dates during period. Please check schedules for exact dates. For more information, tickets or reservations on these or other Branson shows, attractions, events, or lodging, please contact the Branson Tourism Center, one of Branson’s largest and most respected vacation planning services and sellers of over 5 million Branson show and attraction tickets by calling 1-800-785-1550 or through their website www.BransonTourismCenter.com. This entry was posted in Branson Attractions, Branson Events, Branson Shows, Featured on September 30, 2018 by Gary Groman.